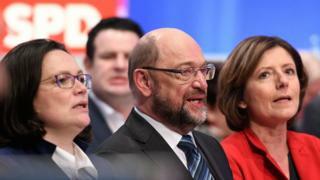 Germany’s Social Democrats (SDP) have voted for coalition negotiations with Chancellor Angela Merkel’s conservatives, their former coalition partners. Earlier this month the two groupings agreed a blueprint for formal talks. Mrs Merkel’s centre-right CDU and its Bavarian CSU ally have been unable to form a government since September’s inconclusive election. The far-right Alternative for Germany (AfD) won 94 seats in parliament. In preparatory talks earlier this month, the parties overcame key sticking points on issues such as migration. They agreed to limit asylum-seeker arrivals to about 200,000 annually and may also cap at 1,000 a month the number of migrants who will be allowed to join relatives living in Germany. Afterwards Mrs Merkel and Mr Schulz said they were optimistic a new “grand coalition” could be formed and spoke of a “fresh start” for Germany. Both stressed the need to ensure Germany’s “social cohesion” amid tensions over the influx of asylum seekers. German official figures show that 280,000 asylum seekers arrived in 2016, a drop of more than 600,000 on the total for 2015. Arrivals fell after EU countries and Turkey tightened border controls. However, the huge number of 2015 arrivals – many of them Syrians, Iraqis and Afghans fleeing war – created a major integration problem for German authorities.